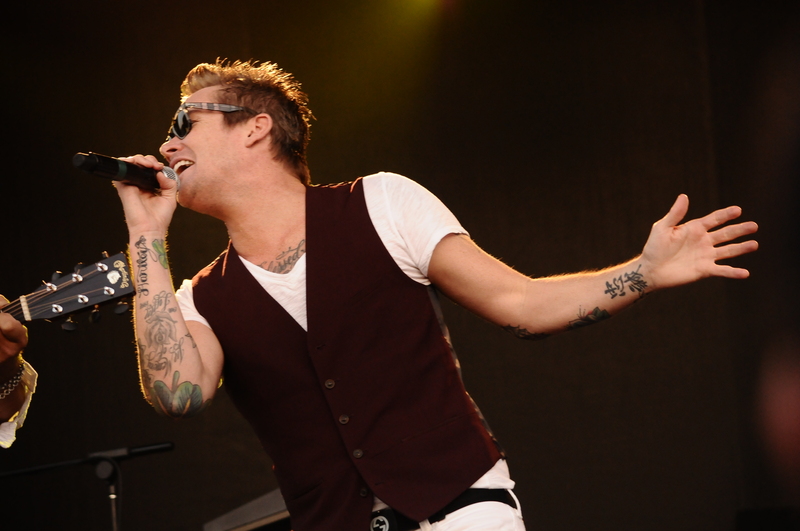 Mark McGrath is the lead singer with Sugar Ray. He also was a co-host of Extra as well as host on Don’t Forget The Lyrics. McGrath also organized the first Summerland with Everclear’s Art Alexakis and has since branched off on his own Under The Sun tour. 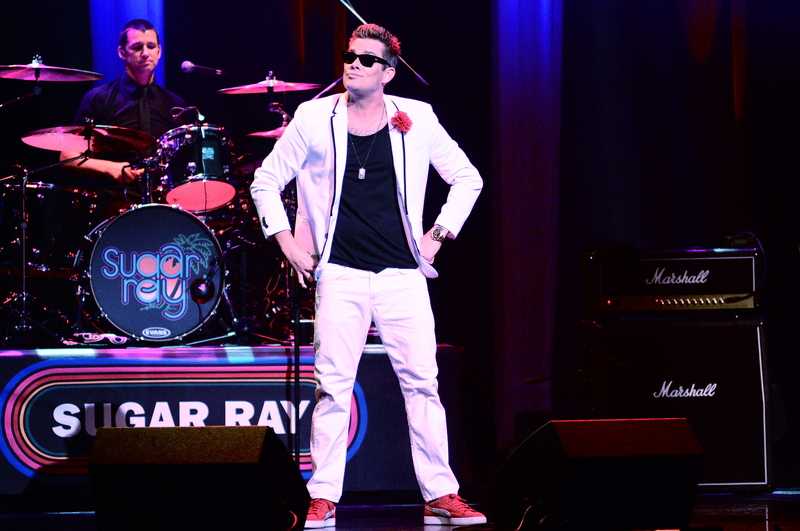 Sugar Ray played a pair of dates in Niagara Falls, Ontario at The Fallsview Casino and Resort this past weekend. We had the chance to catch up with Mark so he could fill us in on the latest. RSC: Tell us about Under The Sun 2014. Mark McGrath: Yeah. This is actually gonna be our third year of doing Under The Sun even though technically its gonna be our second year calling it Under The Sun. A couple of years ago Art from Everclear and I got together and decided it was time for a nineties package tour to go out and celebrate that great music from that era. The only problem was we couldn’t decide if the nineties had ever ended yet. I can tell you exactly when the eighties ended that was when Nevermind by Nirvana came out and the eighties were over you know. But the nineties is a little different. Even today the top ten touring acts you see in Pollstar half of them are from the nineties. Whether its Pearl Jam or Soundgarden, Dave Matthews or Red Hot Chili Peppers so it seemed like it never really ended. So we got together and decided to put the tour up that first year it was called Summerland. We had a lot of success and it was a fun tour. We kind of had a different opinion the second year, meaning last year of how to go about it. I wanted the tour to be as broad as possible, to incorporate all genres, hip-hop, R&B, that’s where I see it going in the future. He wanted to be a little more specialized, having it be hard hitting guitars and that kind of thing. So he’s still doing Summerland and I’m doing Under The Sun. This year we have Blues Traveler, Uncle Kracker Smash Mouth and Sugar Ray. Any one of those bands could headline this tour and will headline and anyone of those bands can open the show. Basically we can pretty much guarantee you an entire set full of hits. That’s how it came together. RSC: Do you know if there will be any more dates added? MM: I’m pretty sure the dates that are up are gonna be the ones that are up. We looked at about thirty-seven, thirty-eight dates, it’s about six or seven weeks. At this point in our lives we all have families and that kind of thing. No one really wants to be out there longer than six, seven weeks. We’re fortunate to be in a position to dictate the flow of the tour. RSC: Do you have a say in choosing the lineup or is that up to the promoters? MM: Yeah I get a hand in there. There’s your wish list of bands you want to get. Then there’s a reality of the band’s. Then you put a list together of hopefuls and you kind of leak them out to the promoters and see if they like the show. Fortunately the last year we had The Gin Blossoms, Smash Mouth, Vertical Horizon, Sugar Ray and Fastball that was an easy sell. This year was the same way, people came right on board and we had this line up together. So yeah, I’m very involved with creating the line up. This year’s is a little more diverse than past year’s. There’s my fantasy idea, I’d like to have En Vogue on here with Naughty By Nature and the Proclaimers and Collective Soul. I’d like to be all across the board, so as the brand gets a little more momentum, we’ll be able to take some more chances. Hopefully in the future it will grow. RSC: Any thoughts on doing a one or two day festival like the M3 Festival or Rock On The Range? MM: The festival business is kind of picking up in the States. We’re kind of behind Europe and the UK. They really took the ball in that one in terms of festivals. There are so many festivals in Europe and England, now America is starting to come on board with the festivals you mentioned. Coachella’s getting bigger every year, they have two weekends now. So I think that’s something we can shoot for in the future where we could do isolated dates or maybe do something in the fall. That was the idea we originally had. We wanted to be like ten to twelve bands but the logistics for something like that in a touring scheme is really tough to pull off. So we’re still in the infancy stages of growing this thing as an annual festival. RSC: If you did get to that point where would be the ideal location to hold it? MM: Well that’s an interesting thought. You know I hadn’t thought about that. I’d have to think and test the waters. I learned there’s your initial gut reaction of where it should be and then there’s the reality. I’m kind of a dreamer I’m a Pisces you know…so i have these big thoughts in my head. I have smart people around me that have business acumen to keep my dreams in line. Boy that’s a good question. I’ll pick my brain and that’s something I’d have to get back to you on Joseph (laughs). RSC: Your last album came out in 2009. Will there be another Sugar Ray album of all new material in the near future? MM: I can’t see another new Sugar Ray record happening anytime soon. But I am working on new material. You know I always wanted to put out a solo EP of sorts. The way people are doing it now are putting EP’s and even singles. It’ going back to a singles business like it was in the fifties and sixties. That would be the next release you’d see from me. What I do is very similar to Sugar Ray. I write songs that basically sound like our singles that’s what our audience’s responded to the most. We’ve added a new song to the Sugar Ray set that I hope to release on an EP of mine by the end of the year. When you’re in a band you do two things. You write music and you play it live. I’m playing live a lot lately. We just haven’t done a lot of writing music. The bad news is we don’t have a record deal but that’s also the good news. There’s no pressure of it having to come out at a certain time. There’s no pressure of business or commerce. I’m very realistic about a Mark McGrath record. It would strictly be an artistic exercise. It would be a big thank you to the fans for sticking by us. We went into the studio last spring and recorded a couple of songs and we just didn’t love them. One made it into our touring set and we retooled it and rearranged it and it seems to be working a lot better. It’s a song called “Summertime’s Coming” and we’ll do a couple more and we’ll have that done by the end of the year. We’re gonna go in the studio in September after the tour and knock a few songs out and see what we come up with. RSC: Are there any other upcoming projects or releases you’d like to plug? MM: I don’t want to brag but I will be in Sharknado 2 coming up in July on the Syfy Channel which is kind of fun. It’s this movie that took off on social media on the Syfy channel. It’s your low budget kind of shock horror movie and it tok a life of its own and the movie made it into the theaters believe it or not. They made a second one and they reached out to me and of course I said no problem. I found myself acting with Judd Hirsch in a cab on Broadway in the middle of Manhattan. This is surreal. Incredible moments still happen to me. I look forward to Sharknado 2 coming out in July. I look forward to that EP we were talking about as well. I’ve been very blessed to be in this band. I love performing, now that we hit cruise control with the band, I’m still loving it more than ever. I look forward to carry on the legacy of these hip songs that mean a lot to people and obviously mean a lot to us for the rest of my life. RSC: Out of the current music scene these days are there any artists or bands that standout? MM: Bands are kind of going back to a state when I was growing up the eighties. Like this new wave era of bands like Psychedelic Furs and Duran Duran. There seems to be a new romantic return, synth heavy bands. There’s a band called Bastille I like a lot. Broken Bells are another band I think are amazing. Those are two bands that stick out to me right now. I think Jake Bugg, he’s sort of the new kid from the UK. He’s being touted as the next Dylan. I know when people hear that I can see them shaking their heads. But this kid really has the goods and he did a record with Rick Rubin recently that’s out of this world. He’s a real true talent so young and to write songs of that depth its pretty impressive to watch. I’m pretty tapped in to the new stuff and I like where its going. There’s no more business and I was part of the late nineties hey day when there were billions of records being sold off one single. It was a lot of fun. It was greedy, it was ova-lent but it was fun being on the other end of that I’ll tell you. It’s a shame that the music kind of imploded. So I always keep my eye out for new bands because my love of music has never wavered. But the business it disappeared. Unfortunately when your in position like we were, you have to keep your eye on the business too. It sounds terrible when you start adapting all these Legal E’s terms into your national vernacular. But if you’re not into the business, I mean you’re an idiot. we’ve seen it happen time and time again. Just watch Behind The Music if you want to see a band not pay attention to their business.